This extraordinary cure carries a very special power to turn bad into good. This really is one of the most protective cures you can use and also a powerful cure for the #2 star that falls into the northeast palace in 2019. If you are suffering from an illness you would place beside your bed, for study, creativity and business place on your desk. 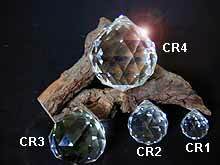 For flying star, you would use it with the #2 & #5 (SW) (NE) to ward off bad luck and for #6 (E) star for legal problems and protection against business competitors. 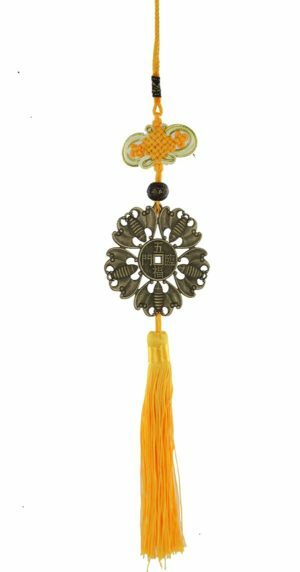 This particular amulet was made for us and carefully placed together with a red ribbon lucky knot signifying wealth and protection for the building. 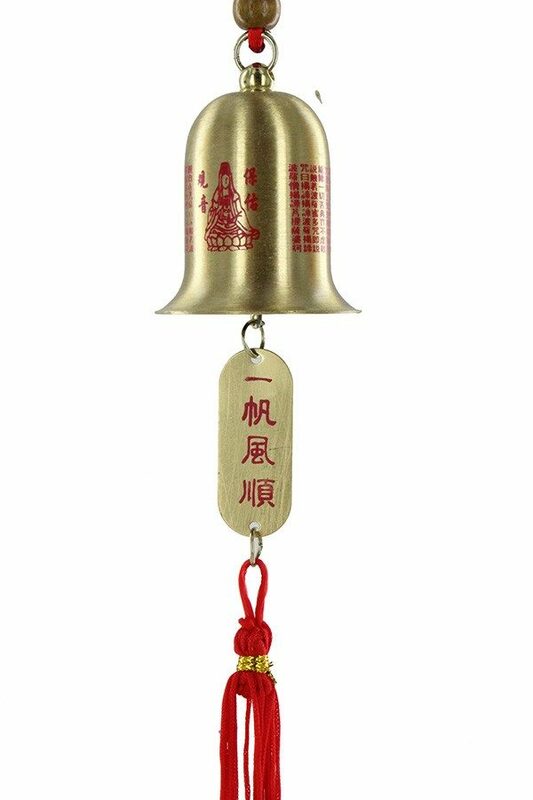 This stunning bell has been made to exact measurements to ensure accuracy, as in Feng Shui, measurements are crucial and also little known. So whilst this magnificent cure and enhancer may seem quite simple in design it is actually extremely potent and a little known cure and the measurements of the bell and ribbon to the gold band falls in the “Kwan” measurement which is said to bring in good fortune and prosperity to the owner. 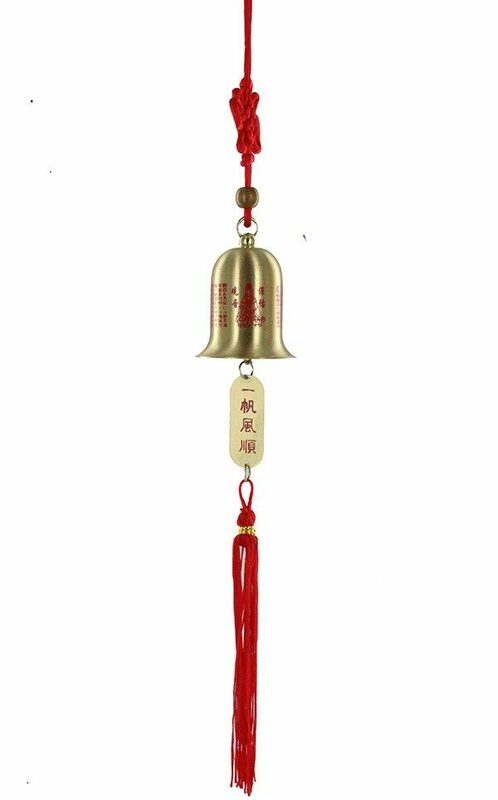 The special arrangement of the image of Kwan Yin and script is a powerful combination and can also be used for cleansing Feng Shui cures and enhancers by ringing the bell in each room. 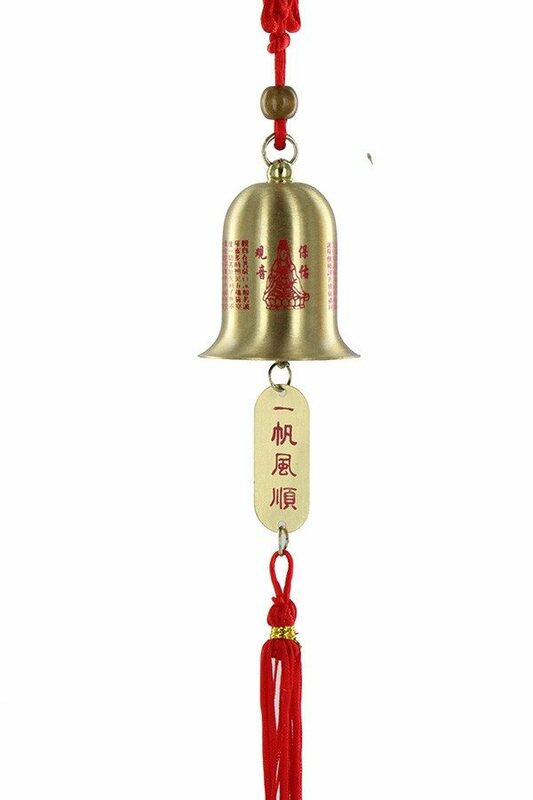 The bell is carefully tied with auspicious red ribbon with a Chinese lucky knot at the top. This Feng Shui cure is especially designed to pacify the #2 black Flying Star which brings accidents, financial loss and calamities of all kind, and can also be used to control any other earth energy afflictions like the #2 sickness star. This bell captures bad energy and transforms it into good energy. 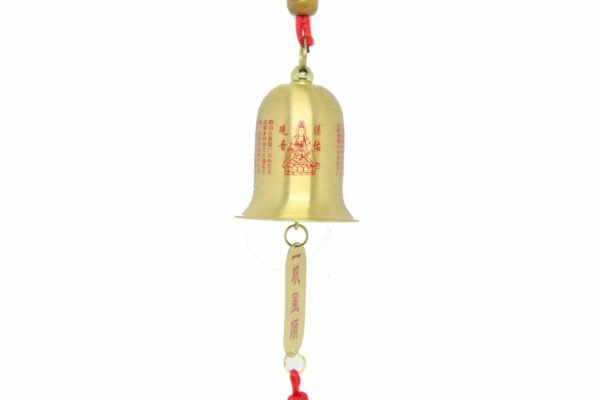 This bell which produces an amazing clear ring can be used for meditation or for space clearing in Feng Shui. Space clearing is very good in attracting new business opportunities and increasing sales. The calming harmonics created by this bell cleanse all space ‘touched’ by the sounds. 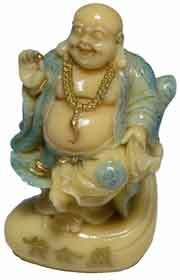 It enhances and purifies the qi, invigorates and nourishes stagnant qi with balanced yin and yang energy, disperses negative energy, creates a sense of tranquillity and transmutes inauspicious energies into auspicious energies and produces Sheng Ch’i, the intrinsic energy which brings good fortune and luck. Another important aspect is the Chinese four row rhombus (fire element shape and colour) Mystic Knot is also known as the Pan Chang Knot and it denotes the endless cycle of nature and a perfect cure for the #2 as this causes an alchemy in Feng Shui with the two elements working in synergy. You must only use a rhombus type knot with four rows and not circular or square as this enhances the earth element causing more problems. 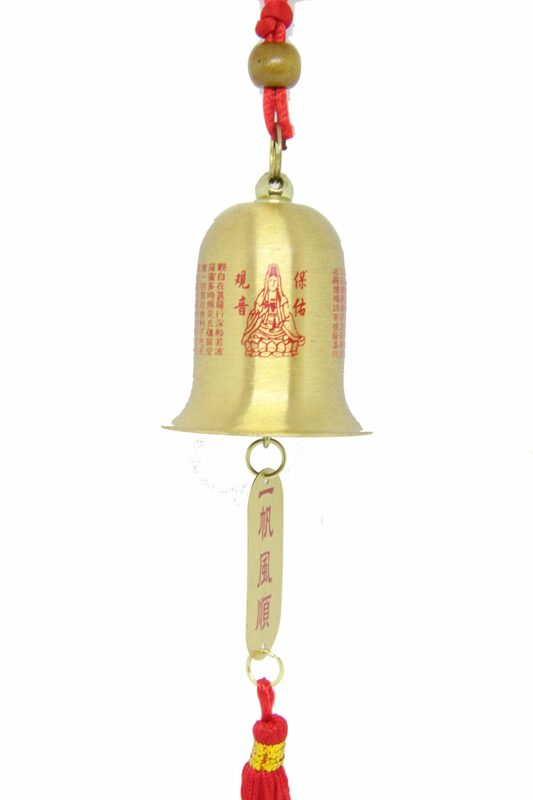 It is very important that the overall height of the bell, tablet and mystic knot up to the gold band must fall within a “Yi” sector for which is approximately between 165 – 210 mm and this cure is nicely positioned within Yi (without the red tassel) which is helpful people and said to bring power, protection and also improve wealth luck. This is such a nice traditional cure and enhancer and this year it should be placed in the northeast in 2019. Made from a nice good quality weighty alloy and looks and feels quality. 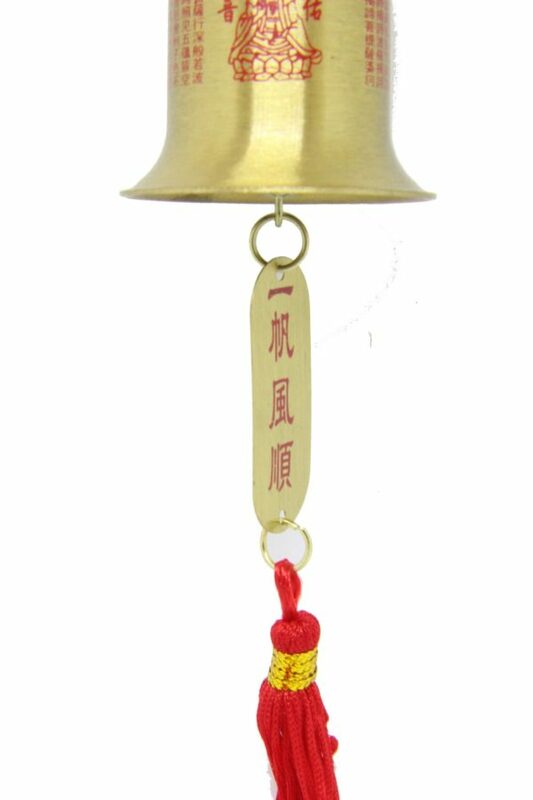 Where do I place the Guanshiyin protection bell in 2019? 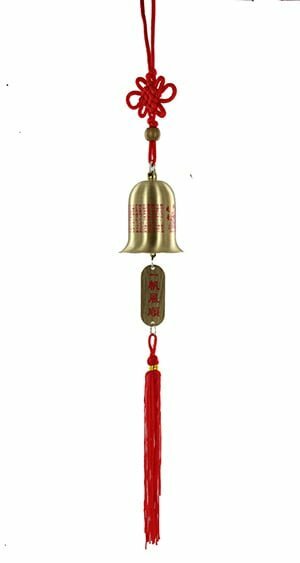 How do I display the Guanshiyin protection bell in 2019? 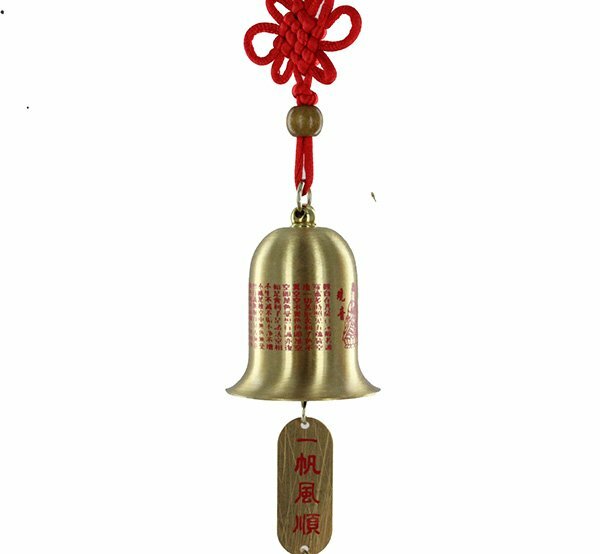 When should I display the Guanshiyin protection bell?